So planets are those lumpy things that orbit stars, right? Well, if all of the recent nonsense about definitions is to be taken seriously. That’s why there are ridiculous terms like “planetar” and “planemo” being thrown about. As far as I’m concerned though, if it’s round and smaller than a star, it’s a planet. But planets get flung about quite wildly as they form. Statistically, a few must get thrown out of their parent star system altogether. You’d think they’d just end up lost in the voids of interstellar space, frozen, dead and alone… You’d think. With no stellar wind to ablate them all away, he hypothesised that these “rogue planets” could hold on to thick atmospheres of hydrogen gas. Due to the insulation provided by this hydrogen atmosphere, he even hypothesised that these planets could retain enough surface warmth to have liquid water. They could potentially remain hot for some time, courtesy of geothermal energy and radioactive isotopes decaying. In turn, should one of these planets retain a moon (and apparently, around 5% of ejected Earth-sized planets could), tidal heating could also be a contributory factor. It sounds far fetched, but his theory looks pretty sound to me. Dare I say it, rogue planets have long been a mainstay of science fiction (by Arthur C Clarke amongst others), but it’s almost certain that there must be at least a few out there. By probability alone, I put it to you that the Milky Way is large enough that if it’s possible, it has probably happened. In turn, by basic celestial mechanics, conservation of momentum causes the smallest member of a three body system to be ejected readily. With the right trajectory, a gravitational slingshot could easily set such a planet on a course for interstellar space. Just like the Voyager probes. 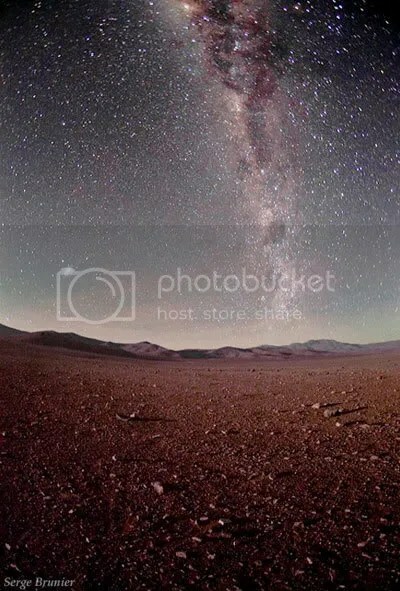 By the way, that image was taken over the Atacama Desert. It’s by a guy called Serge Brunier as part of The World At Night. Go and check it out, some of those photos are truly awesome! This entry was posted in Imported from Livejournal and tagged astrophotography, planets. Bookmark the permalink.